A monologue on currency devaluation through the process of inflation. Greetings, I would like to talk about a subject of which I believe to be of great importance. It is to do with the devaluation of our currency. The continual and increasing issuance of U.S. dollars has steadily eroded its value. This has been particularly pronounced since abandoning the final vestige of the Gold Standard some forty years ago. 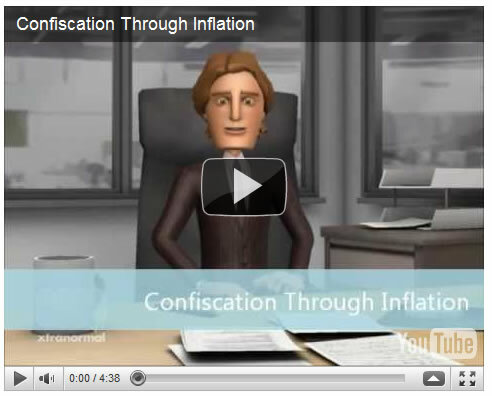 John Maynard Keynes, perhaps the single most influential economist of the 20th century, said that, "by a continuing process of inflation, governments can confiscate, secretly and unobserved, an important part of the wealth of their citizens." 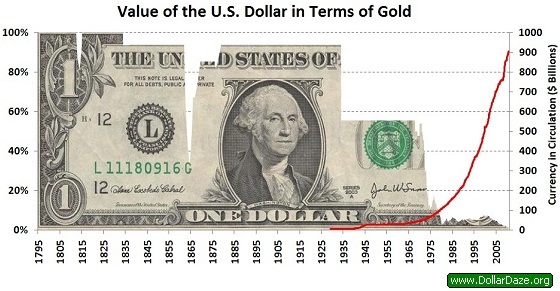 The following chart shows the value of the U.S. dollar in terms of gold. As you can readily see, the dollar has depreciated over time. With the Coinage Act of 1792, the dollar was officially defined in terms of silver. The nominal gold price at this time was equal to $19.39. The first devaluation occurred during the War of 1812. After hostilities ended the pre-war convertibility was restored. Following the Coinage Act of 1834, the dollar was revalued and one troy ounce of gold had the nominal price of $20.67. During the U.S. Civil War, convertibility of the U.S. dollar was suspended. But again, as with the War of 1812, the pre-war convertibility was eventually restored. The Gold Standard Act of 1900, officially defined the U.S. dollar in terms of gold, instead of silver. 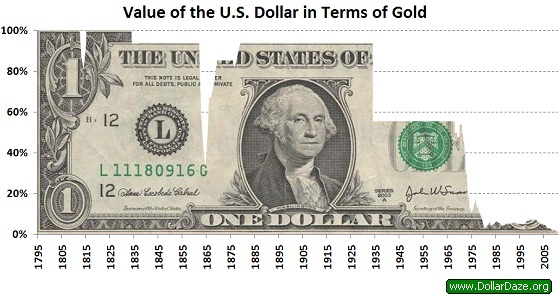 The next drop in the value of the U.S. dollar came as a result of the Gold Reserve Act of 1934. This act was part of the measures put forth by the Franklin D. Roosevelt administration during the Great Depression. This act set the nominal price of gold at $35. After the Second World War, the dollar continued to be convertible to gold at the pre-war rate, but was the only currency in the world to be so. Through the Bretton Woods Agreements of 1944 all other currencies were to be held within tight trading bands to the U.S. dollar. In 1971, it was feared that the United States Treasury would be unable to continue its obligation of redeeming dollars brought in by foreigners for gold. On August 15th of that year the so called "gold window" was closed. The severing of this last connection between gold and paper money meant that all the world's currencies now "floated" against one another. Gold soared from $35 to $195 an ounce by the end of 1974. With some notable ups and downs, U.S. dollars have continued to buy less gold. As of December 2010 it now takes over $1400 to purchase one troy ounce of gold. This represents a 97.5% loss of purchasing power in just under 40 years. The following chart, super-imposes the amount of currency in circulation. As we can see, there is an expected decline in the value of the U.S. dollar as greater amounts are produced. If this trend disturbs you, as much as it does me, then you would find it prudent to transfer a sizeable portion of your wealth into something that has a proven history of being a store of value - such as gold.